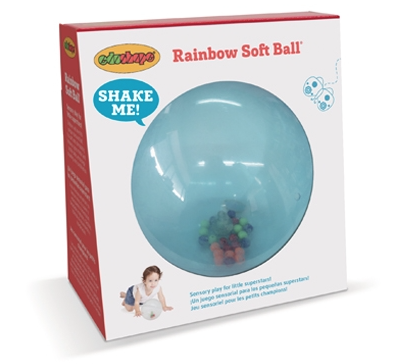 Mail4Rosey: Edushape Clear Rainbow Ball is the Perfect Gift for Smaller Children! Edushape Clear Rainbow Ball is the Perfect Gift for Smaller Children! Some days he looks so big to me, more like a young boy than a small child, but every once in awhile, like in the picture above, he still looks like a wee lad. The Rainbow Soft Ball isn't for him, but it sure is cute, isn't it? And he liked it enough too, that I had to convince him it really wasn't for him, lol. When the ball moves, the colorful beads move too. It's super lightweight, so even the youngest of babies can hold it and make it move. This is an instant hit and a surefire way to get the kids smiling. I still watch when the youngest children are around anything that has small pieces, and I recommend that you to doo, but that plug you see doesn't open, so it's not going to pose a choking hazard. No every ball is the same! At Edushape, we develop toys with a sharp focus on learning, discovery and fun. Our products simulate pure imagination, enhance motor skills and encourage exploration in a safe learning environment. This unique and transparent ball allows children to see the colorful mini balls moving around the inner core as they play. Will amuse and stimulate young minds for hours of fun. Ball size is 7". Great for ages six-months and up. There are so many great toys for kids these days. I love all the toys that bring their imaginations alive. I'm telling you your son is adorable. You can tell him I said he's handsome. I know that you will too, Launna! Thank you for the kind words. Wishing you a wonderful day! It does look like something little ones would really enjoy! Oh that looks fun. So good to help with motor skills. That's really adorable. No wonder even the big kids like it. It's perfect for babies because they can play with it without hassle and worries! Awe, this makes me miss mine being so little. They would have loved the edushape rainbow ball! Love it! It does look like something children would really enjoy! Love the colors! Wow! That is really cute. Perfect for my son. I'm sure he will love that. This does look fun! My nephew Edison would love this! That looks like a really fun toy!! That would look like a fun ball for my 2 year old god daughter. She would love it. I keep saying I am going to get balls for her to play with... but haven't done it yet. buying toys appropriate for the kids age is a must for all parents and also a guide for gifting. This toy looks fun to play with. I have never seen this one before. This would be perfect for the little one that I watch during the week. What a neat toy for little ones. My nephew would love this. Oooo how fun is this ball?!?! I bet my daughter would love it! She loves toys like this! What a clever ball! I can see how small kids would like it. This looks like a really cool ball. I love toys that helps aid in healthy development and at the same time allows children to have fun. My nephews both loved any kind of ball when they were small. They still do, lol. This would be great for young ones.